You should see Robbie gobble these down, a guy who professes to not like chocolate. I had to hide them from ourselves in the freezer, which works for me, but after dinner he just reaches in, opens the container, and eats one frozen! Where do you draw the line between a muffin and a cupcake? I mean, we’ve all had a muffin somewhere so loaded with sugar they truly qualify as a cupcake, without the frosting. 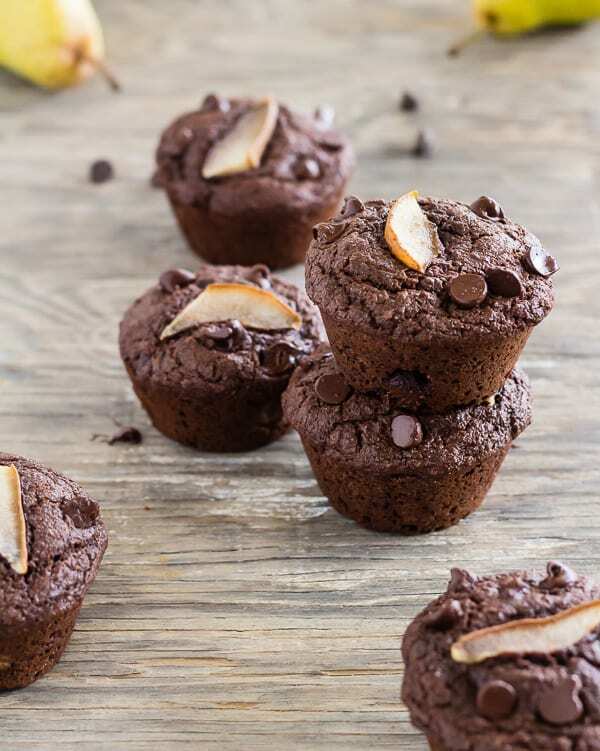 You could say I’m guilty of such–there’s a honey-sweetened chocolate zucchini “muffin” here on the blog. I personally know someone who’s served them unfrosted for her little girl’s birthday! Here’s my logic. If they have frosting, they’re cupcakes; if not frosted or glazed, they’re muffins. 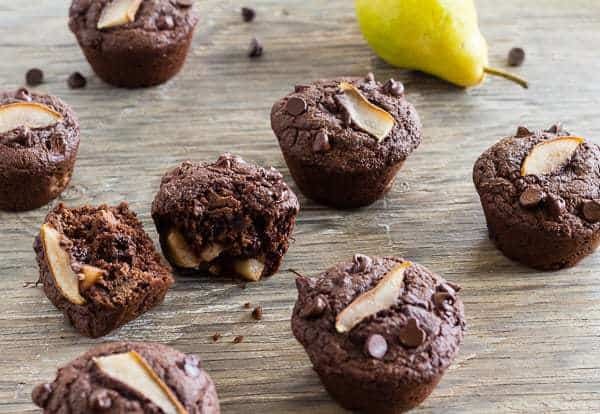 With plain yogurt, whole wheat flour, and coconut oil, naturally sweet with maple syrup and fresh pears, and nary a creamy gild-the-lily swirl, we’re talking a healthier chocolate muffin! 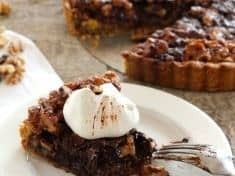 Letty’s Kitchen subscribers, you got a preview chocolate maple pear recipe in this month’s newsletter. If you made them, you know the recipe, all loaded with pear and chocolate chips, made more than a baker’s dozen. (I baked the extra batter in coffee mugs.) Since then, I tweaked the recipe, more than once, to yield an even dozen! A muffin trick, meant to catch the rising batter at its peak with nice muffin tops, is to preheat the oven to 25 degrees warmer than the temp you bake them at. When you slide in the muffin tins into the oven, dial the temp back down for baking. About cocoa powder: Natural or Dutch process? The alkaline baking soda in this recipe is there to balance the acidity of the yogurt. If you’re slow to get these babies in the oven, you can actually witness the reaction of the two. Baking powder, already a combo of acid and alkali, evens things out. As in, with “double acting” baking powder, some of the rise happens as soon as the batter is mixed, the second rise with the oven’s heat. You might also like these cinnamon poached pears with chocolate sauce, the pears poached in a pressure cooker. Make it a fabulous week–get in the kitchen and bake something delicious! 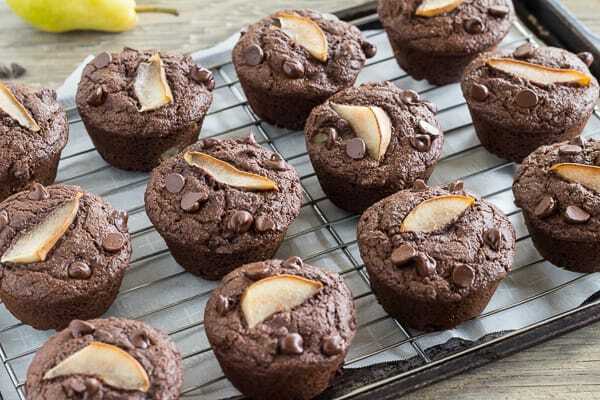 These muffins offer a most pleasant munchiness if your pears are ripe, yet still firm--not super soft. Makes 12 muffins. Preheat oven to 400°F. Spray 12 muffin cups generously with cooking spray. To make sure the muffin tops release with ease, coat the top of the pan as well as the inside of the cups. Sift or whisk the flour, baking powder, baking soda, salt, and cinnamon together in a large mixing bowl. Set aside. In another bowl, whisk the cocoa powder and hot water into a smooth slurry. Add the oil or butter, maple syrup, eggs, yogurt, and vanilla, whisking until well blended. Pour the chocolate mixture into the dry ingredients, stirring gently with a spatula. When there is just one streak of flour left, gently mix in the chopped pears and the first ½ cup of chocolate chips. Divide the batter into the prepared muffin cups using a heaping #16 cookie scoop or 1/3 cup measure. 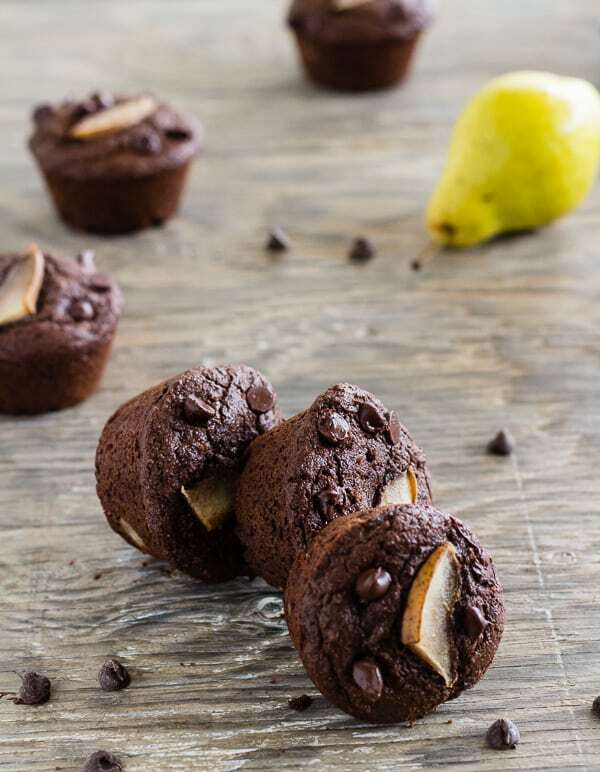 On top, arrange a pear slice and sprinkle with the remaining ¼ cup of chocolate chips. As you place the muffin tins in the oven, reduce the oven temperature to 375°F. Bake 14 to 16 minutes, until the tops of the muffins spring back when touched with a finger and a toothpick inserted in the center comes out clean. Cool at least 10 minutes, before removing from the muffin cups. 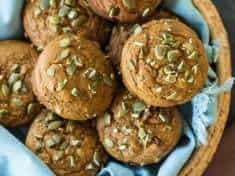 A muffin trick, meant to catch the risen batter at its peak, and rise with nice muffin tops, is to preheat the oven to 25 degrees warmer, and when you open the oven to slide in the muffin tin, dial it back down for baking.